One of my goals for this blog is to write about the Persian food that is consumed during holidays and celebrations of the various religions and ethnic groups that exist in Iran. Today, is the first of these series since it is the Armenian Christmas. When I was little and lived in Iran I remember visiting my mom’s friends who were Armenian. I guess my mom had many Armenian friends because she attended a French Catholic school in Tehran where they studied French in the morning and Farsi in the afternoon. A couple of days ago I had a very lovely chat over the phone with one of my mom’s Armenian friends, Lily Khanoom, who now resides in Colorado. She was very gracious and spent some time on the phone with me and shared some very interesting information with me all the while she was prepping a delicious feast for Christmas eve. Armenians around the world share the same holidays season which begins from the first of January until the sixth, which is today. Presents are opened either after midnight on New Year’s Eve or in the morning of January first. During this six day period is customary for family and friends to pay home visits to each other. Christmas eve is celebrate in the evening of the fifth and Christmas day is celebrated on the sixth of January. When I inquired about the food I was really surprised to find out that Armenian Iranians have different culinary traditions than the rest of the Armenians around the world. The food that they traditionally eat either on Christmas eve or day is Chelow, white rice, with Kuku Sabzi, a frittata with various herbs, and Mahi Doody, smoked white fish. Some families make white rice, however, others, like Lily khanoom, make Sabzi Polow, rice with herbs. The reason why I was surprised at such discovery is the fact that those are the same dishes that Persians eat for the Persian New Year, Norouz. The only difference is that Armenian Iranians don’t eat Ashe Reshteh, a hearty Persian noodle soup, for the New Year. I was also surprised to find out that the Armenian sweet bread Gata is not a Christmas sweet, as I was under the impression, but it is traditionally known to be associated with Easter. Lily khanoom was gracious enough to share with me her recipe for Gata, which will make an appearance on this blog during Easter. And have no fears, all of the dishes mentioned above will also be featured during the weeks leading to the Persian New Year in March! If any of you readers belong to the different ethnic and religious groups that live in Iran, I would love to hear from you and hear all about your culinary traditions so that I can feature them on here. Merry Christmas to all of our fellow Armenians! My roommate is Armenian! Thanks for the information! Very interesting info. Great idea to explore this aspect of Persian culture and food! Thanks, great website, and interesting read on this article. My girlfriend is Armenian, and she bakes a lot. i believe since they are armenian/iranian their cuisine is almost like ours. we have some armenian /iranian friends and they eat almost the same food that we do. what i noticed is that they are very happy and loving people. Thank you for a wonderful post! As an Armenian (from Armenia, now in NYC) it was so pleasant to read about our culture mentioned in your blog. I’ve been looking for some Armenian food blogs online, but couldn’t find any substantial ones. Then I bumped into yours, I’m so glad I did because so many of the recipes on your blog resemble ours and they are a delight to read, not to mention the excellent photos! Can you please post some more authentic Armenian recipes, I would love to learn how to cook from both cuisines. Cheers and thanks! As an unfortunately fully assimilated diasporan Armenian in the US, I’ve always been curious about the Armenians of Iran, how their lives, customs, and cultures blended, or didn’t, with Iranians. It was lovely to read this blog entry about the sharing of food cultures. It gave me an insight into both cultures and the food sounds delicious. @ GuyFromCanada, thank you for your comment! @ Maryam, I assumed the same thing but I also wondered how much of the Armenian culinary traditions are followed by those who live in Iran. I suppose it is natural to assimilate! @ Eve, I’ve got my hands full with Persian dishes so I don’t see myself making authentic Armenian dishes any time soon since I wouldn’t even know where to start. But if they fall into the Armenian/Iranian category they will make an appearance here. @ Tina, thank you for your kind words. It was just as fascinating and interesting for me to find out and write the Armenian/Iranians! Given the positive response, I am so glad I decided to post about it! Your Mom went to Jeanne d’Arc ? Yes! my mom did go Jeanne D’Arc! I was also a Jeanne d’arki , half a century ago ! There are so many of you! I think my mom mentioned that those who live in the US get together every so often. You can see a picture of my mom in her youth on the Dec. 22nd post. Do you recognize her? No, unfortunatly, I don’t recognize her, but I also used to go to photo Afshin studio ! such is a small world! Same school and same photo studio!!!! 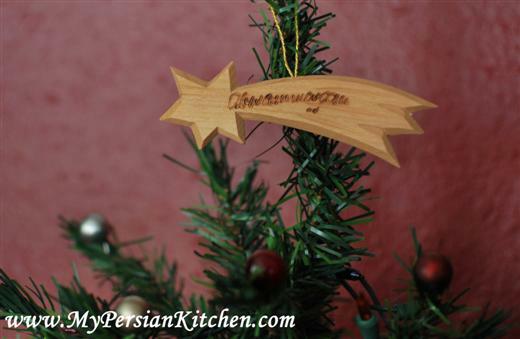 I was fascinated to read about Persian food with regards to the Armenian Christmas. I am a teacher and on Thursday, I am introducing my pupils at school to an Armenian Christmas. One of the pupils is Armenian and her mother is going to dance for us. I was in Iran 40 years ago and have fond memories of both the Iranians and Armenians. I taught many children with the surname…….ian!! I still remember my Farsi, but unfortunately, learnt no Armenian. A Happy Christmas and Now Rouz. I did the latter two years ago at school, as I had an Iranian pupil in my class. Stephanie, thank you for your comment. I am so moved by the fact that you take the time to find out more about your students’ culture and share them with the rest of their classmates! Now that’s the definition of being a good teacher! Persian/Iranian dishes are so healthy, deliciouse, and tasty no matter what you call them. As I recall from the time I was little girl I always loved and enjoyed family dinner. The fresh, aromatic herb mixed with rice”sabzie polo” , and Mahi(fish). unfortunately, no I don’t. I didn’t the recipe was not easy to replicate because I did not have the correct amounts for the ingredients.